﻿Henry David Thoreau was an American author (essayist, poet and philosopher), surveyor, historian and naturalist. He was a leading figure in the transcendentalist movement, which flourished in nineteenth-century New England. He is known best for his book Walden, or Life in the Woods (1854) and his essay “Resistance to Civil Government” (also known as “Civil Disobedience”). He is considered a key figure in the development of modern environmentalism, and is often thought of as a proto-anarchist. 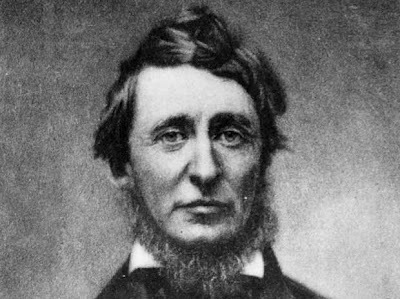 His philosophy of civil disobedience influenced Tolstoy, Gandhi, and Martin Luther King, Jr.
Thoreau was born in Concord, Massachusetts on 12 July, 1817. And he died there on 6 May, 1862. He studied at Harvard University in Boston and worked as a teacher in Concord. He met the writer Ralph Waldo Emerson, who introduced him to a wide circle of authors and thinkers who lived in and around Concord, including Ellery Channing. It was Channing who advised him – in March 1845 – to go out into the woods, build a hut, and “begin the grand process of devouring (himself) alive.” He decided to do just that. On 4 July, 1845, Thoreau moved a couple of miles out of town and began to build his own hut on land owned by his friend and mentor Emerson. The fourteen acres contained a second-growth forest and were located beside Walden Pond. 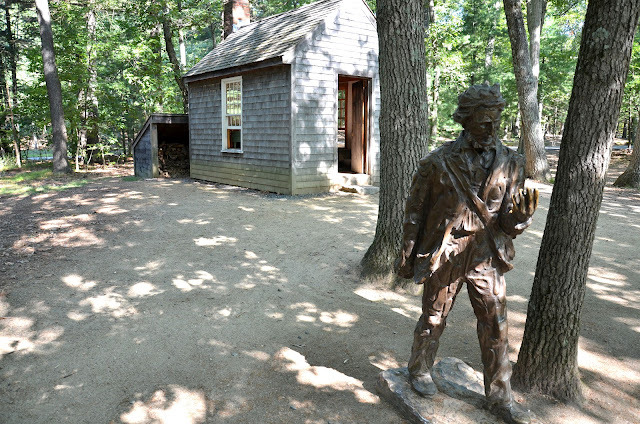 After two years living in the woods, Thoreau left his hut at Walden on 6 September, 1847. 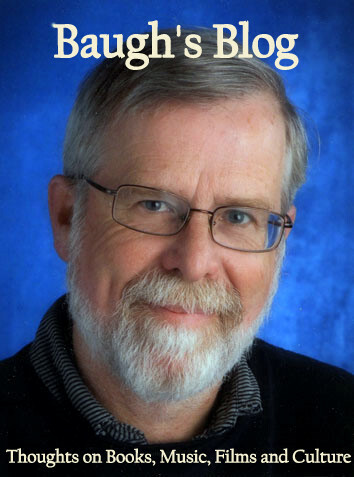 He worked on the manuscript about his experiences there – and his thoughts about their significance – for many years. The resulting book, Walden, or Life in the Woods was finally published in 1854. "If a man does not keep pace with his companions, perhaps it is because he hears a different drummer. Let him step to the music which he hears, however measured or far away." On 22 August, 2012, my son Colin and I made a visit to Walden Pond, in order to see the place that had inspired this interesting character to write his influential book. It’s located in Walden Pond State Reservation. To get there, you drive south from Concord on Walden Street (Route 126). Right beside the main parking lot at the entrance to the park, they have built a copy of Thoreau’s Walden Pond hut – using the dimensions and details of its construction from the description he provides in his book. 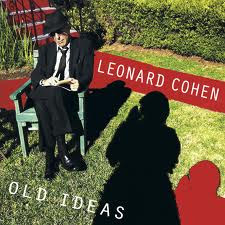 "I have a great deal of company in my house; especially in the morning, when nobody calls." Thoreau’s home at Walden Pond was a one-room hut. It measured 15 feet long (4.5 m) and 10 feet wide (3 m). The door was located at one end of the longer side; the fireplace at the other. There was a window in each of the longer walls, opposite each other. Furnishings inside the hut included a bed, a desk, a chair, and a box for storing dry logs for the fire. The original bed, desk and chair from Thoreau’s hut are now located in the Concord Museum on Lexington Street. Outside the building, there was a woodshed nearby and a cooling cellar dug into the side of a hill. There was no running water, of course; Thoreau would have done his cleaning and washing in the lake. Thoreau would have built the hut from materials collected round about him (sand and stones from the edge of Walden Pond, and timber from trees he cut down), materials recycled from an abandoned shack in the vicinity, and supplies he got from town. A writer for a blog called Shelter Seeker has estimated that it cost Thoreau $28.13 to buy the materials he needed to build his hut – that would be about $2,800 converted into today’s money. Most of the construction was done by Thoreau, although he enlisted the help of a few friends when it was time to raise the roof. Walden Pond is actually much larger than its name implies. It’s a lake of some substantial size. At its deepest point, it is 31 metres deep (102 feet). Walden Pond has an area of about 60 acres (250,000 square metres), and its perimeter measures 2.7 km (1.7 miles). It is a kettle lake, formed by retreating glaciers gouging a deep gash into the landscape about 11,000 years ago. I was a bit concerned, as Colin and I approached Walden Pond, that Murphy’s Law would kick in, and the “Pond” would turn out to be a tiny, stagnant piece of over-hyped, over-ripe water. But as we crossed the road and hiked down to the lake, it quickly became apparent that this was an impressive spot – a quiet refuge of great beauty and repose. 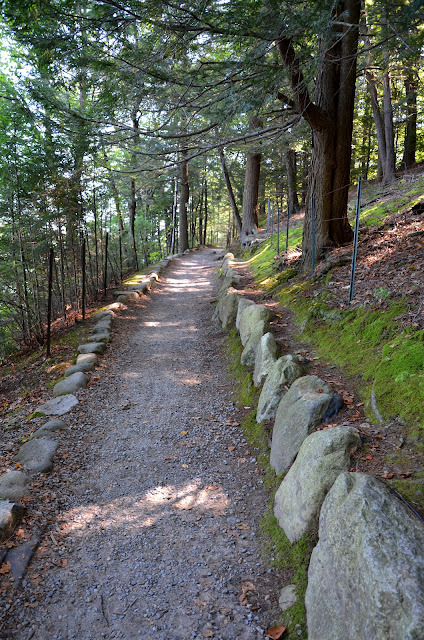 There is a beautiful trail all around the perimeter of Walden Pond. To hike around the lake takes about half an hour. But add on another ten minutes, or so, for a stop at the site of the original hut that Thoreau built near the north-west corner of the lake. It really is a lovely walk. The area is dominated by white pines, which provide shade from the sun, but do not create a dense canopy that filters out a great deal of light and warmth. Both sides of the trail – as you can see in the photo to the left – have a rudimentary wire fence that has been put up to protect the area from erosion. It runs around the entire perimeter of Walden Pond. But there still are regular gaps in the fence which allow access down to the water. And as we made our way around the lake, we encountered individuals and couples using these small access points as tiny beaches from which to enter the water. "The finest qualities of our nature, like the bloom on fruits, can be preserved only by the most delicate handling. Yet we do not treat ourselves nor one another thus tenderly." 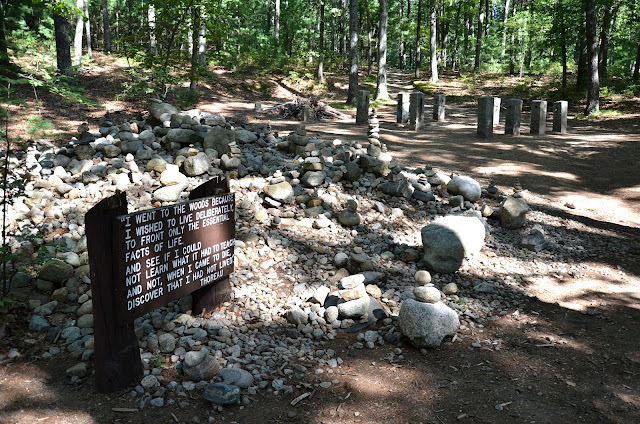 The exact site of Thoreau’s cabin at Walden Pond was discovered by the archaeologist Roland Robbins in 1945. He had a rough idea where it would have been from close reading of Thoreau’s book, Walden, or Life in the Woods, and notes made by Thoreau's friend, William Ellery Channing. He began digging in the likeliest spot, using a two-foot steel probe and a shovel. Within six inches of the surface he began finding bricks – lots of bricks. Then he found some bricks with white plaster attached. And on November 11 he found the proof he was after, the foundation stone of the hut’s chimney. Re-reading Walden later he realized that the date he completed his dig, 12 November, 1945, was exactly 100 years after the day Thoreau had completed the construction of his home in the woods. 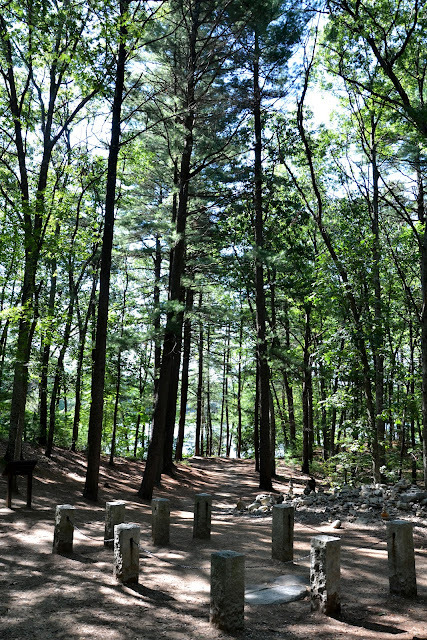 ﻿The nine concrete posts you see in the photo to the left mark out the perimeter of Thoreau’s rectangular cabin. The site is at the bottom of a gentle slope, in amongst a stand of second-growth white pines. If you continue south from here, the land slopes down further for another hundred yards or so to the edge of the lake – a short walk to his source of water for drinking, washing and cleaning. To the left of the site is a mound of stones and a wooden plaque with the famous Walden quote explaining why Thoreau came to live in the woods. Nearby, he dug a cold-cellar into the hillside. When you walk down to Walden Pond from the road, the first thing you see is a public beach. During the summer months the beach is full of families enjoying a swim in the clean water of this attractive lake. But as you walk away from the beach and hike along the trail which winds around the edge of Walden Pond, you move into a quiet area of the park. There are small access points from the fenced trail to the lake at regular intervals; and every other one of these served as a mini-beach for individuals or couples who want to swim in a more private, quieter location. There were steps down to the water on the native rock. The whole mood, for me, in these spots, was one of quiet contemplation in a refreshing and invigorating scene of natural beauty. I couldn’t help thinking of devout hindus in Benares (Varanasi) stepping down the stone ghats into the sacred waters of the Ganges! For those who venerate Henry David Thoreau as a great soul and a wise philosopher, a dip in Walden Pond must conjure up a similar feeling of awe. So our morning visit to Walden Pond was an inspiring event. After hiking along the trail to the site of the Thoreau’s cabin, I asked Colin if he wanted to retrace our steps back (the shorter option), or to continue on all around the lake. He chose to walk the entire trail. I was glad. And it seemed to me that, even though he didn’t have the historical and literary background to underpin the experience, he could feel the special aura of the place. "However mean your life is, meet it and live it; do not shun it and call it hard names." In the early afternoon, we visited Sleepy Hollow Cemetery to see the final resting places of several famous Concord authors: Ralph Waldo Emerson, Nathaniel Hawthorne, Louisa May Alcott and, of course, Henry David Thoreau. Just as Westminster Abbey, in London, has its Poets’ Corner, so the Sleepy Hollow Cemetery has its authors’ corner. And it’s an imposing spot – in the back of the place. After parking the car, you have to walk up a very steep pathway to a ridge. The graves of Alcott and Thoreau are very simple – Thoreau’s is marked with a tiny tombstone, around which are strewn mementoes left by his admirers. Lots of pencils and pens! "As if you could kill time without injuring eternity." Now, if you are really serious about covering all the angles on Henry David Thoreau and Walden Pond, you will also have to visit the Concord Museum. It’s close to the cemetery. You come back into town and then drive a mere half-kilometre south-east on Lexington Road. There is a section in the museum devoted to the town’s eminent authors. This first photo taken at the Museum shows Thoreau’s copy of Wilson’s American Ornithology. He used this popular book on American birds all the time – citing it often in his Journal. He wrote lists of birds he had seen in the book’s margin, and pressed specimens of plants he had identified between its pages. "A man is rich in proportion to the number of things which he can afford to let alone." 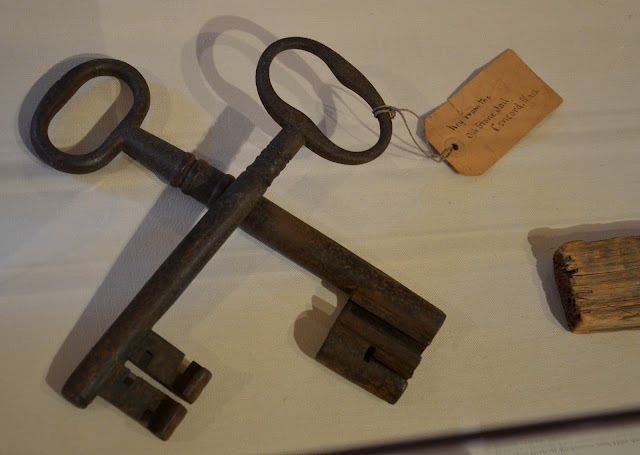 These keys come from the Concord Jail. About three weeks after Thoreau began his experiment in the Walden Pond woods – late-July, 1845 – he encountered the local tax collector, who demanded six years of delinquent poll taxes. Thoreau refused to pay, citing his opposition to slavery and the current Mexican-American War. He argued that he wasn’t going to give the government money that might be used to fund those immoral enterprises. He was thrown into jail overnight for his perceived impertinence. He was released the next day after an aunt, against his will, paid the overdue taxes on his behalf. This event had a big impact on Thoreau’s thinking. In early 1848, he gave some lectures about “The Rights and Duties of the Individual in Relation to Government” – explaining the reasoning behind his tax revolt. He revised these lectures later into an influential essay called Resistance to Civil Government (also known as Civil Disobedience). The essay was published in book-from in May, 1849 and would have a significant influence on like-minded activists like Tolstoy, Gandhi and Martin Luther King, Jr.
actual bed, desk and chair from Thoreau’s small cabin at Walden Pond. There are other interesting reasons to visit Concord, Massachussetts, besides the chance to investigate places associated with the life of Henry David Thoreau. But, if you are planning to visit just for the sake of all-things-Thoreau, you will not be disappointed. He was the focus of only part of my day there, but it was, nevertheless, a definite highlight. "To be a philosopher is not merely to have subtle thoughts, nor even to found a school, but so to love wisdom as to live according to its dictates, a life of simplicity, independence, magnanimity, and trust." Sources: "The Man Who Found Thoreau" by James Dodson in the May 1985 issue of Yankee; "Henry David Thoreau's Cabin" from the Shelter Seeker website. I am Italian, and I love Thoreau' s Phylosophy, and his character: I would go there one day and stay near his Nature. Great Site ! compliments !